Publisher Note - Paper is usually considered to be a practical but disposable material, making it easy to overlook the satisfying process of papermaking and the subsequent pleasure of handling an individual sheet with a unique edge or surface layered with texture and color. There are an infinite number of ways to be creative with paper and basic materials like torn papers, water, mesh, and a wooden frame. 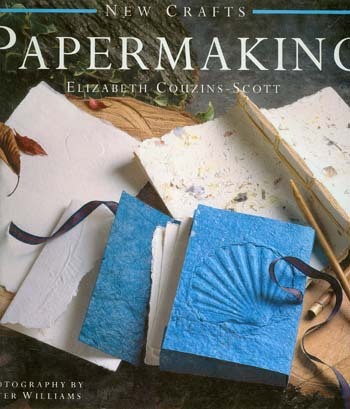 New Crafts: Papermaking features project ideas that a craftsperson of any skill level can use, both to recreate the secrets of this ancient craft and to develop them into contemporary interpretations. The initial techniques section of this book illustrates the basic process of making pulp, making sheets, couching, and pressing. The 25 inspirational project ideas that follow include creating paper sheets with straw fibers by embedding grasses within the wet sheets and molding the paper into three-dimensional constructions. Other projects add more color and texture to hand-made sheets through embossing, embroidery, and lamination. Projects include a Paper Bowl, Japanese Bound Book, Wedding Album with Confetti Paper, and a Patchwork Memory Board. Each project and technique is beautifully displayed in step-by-step detail that will guide any craftsperson easily through even the more complex creative processes. New Crafts: Papermaking details a recycling technique that transforms existing materials into precious and beautiful surfaces. Whether the reader is interested in a simple embossed motif or a rich collage, every handmade project quickly becomes an object to treasure.